Adelaide’s three newest Catholic priests may be on a mission from God, but they had no hesitation taking time out from their orientation program to pay homage to the hallowed turf of Adelaide Oval. Source: The Southern Cross. Coming from India, the priests hold two things close to their heart – their strong Catholic faith and their love for all things cricket. 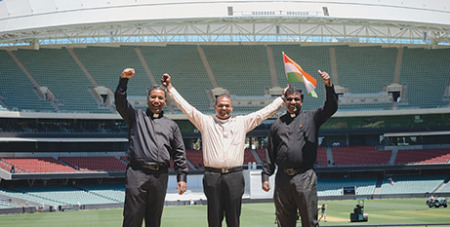 They arrived in Australia last month to serve as priests in the Adelaide Archdiocese and were thrilled to have the opportunity to visit the oval where their heroes Don Bradman and Sachin Tendulkar hit so many boundaries, and to later witness their national team taking on Australia in the Test match. “I’ve dreamt of this moment since I was a little boy,” admitted Fr Vilmal Raj as he took in the great expanse of the stands during a weekday visit to the oval. “My nephew couldn’t believe I was going to be visiting here today,” added Fr Selva Raj, who was eager to send some selfies to prove he was actually at the iconic ground he had seen so many times on television. For the younger Fr Joseph Wales Raja, who still loves to swing the bat and roll his arm over, it was hard to wipe the smile from his face. “I love cricket and I am a real fan. And yes, I would like to take part if there was ever a clergy team playing,” he laughed. Inspired by their visit to the oval, the three priests said they hoped their ministry would be similarly uplifting for Catholics in the Adelaide Archdiocese.